Are you having a great weekend so far? Mine has been quite exhausting... a pile of laundry had to be done *yack* ;) Nevertheless I managed to finish my version of Whiff of Joy's Project of the Month February. The Design Team has outdone themselves, please visit the Whiff of Joy site to have a look at all the creative and terrific projects!! Ich hoffe ihr hattet bis jetzt ein schönes Wochenende. Meines war recht anstrenged... ich mußte einem riesigen Berg Wäschen Herr werden *grusel* ;) Trotzdem habe ich es geschafft meine Version des Whiff of Joy Projekt des Monats Februar fertig zu stellen. Das Design Team hat sich diesmal selbst übertroffen. Schaut doch auf der Whiff of Joy Seite vorbei um euch all die kreativen Projekte anzusehen!! I had another one of those clear heart shaped boxes filled with roses made of soap leaves, which I decorated. Remember this project, I showed you the other day? Ich hatte noch eine dieser herzförmigen, durchsichtigen Dosen, gefüllt mit Rosen aus Seifenblättern, die ich dekoriert habe. Könnt ihr euch noch an dieses Projekt erinnern, dass ich euch vor ein paar Tagen gezeigt habe? I simply rolled the petals and the leaves over an ordinary pen to get the dimensional look and distressed the edges with a white ink pad. Ich habe die Blütenblätter und Blätter einfach über einen normalen Stift gerollt um das dimensionale Aussehen zu erhalten. Dann habe ich die Ränder noch mit einem weissen Stempelkissen gewischt. 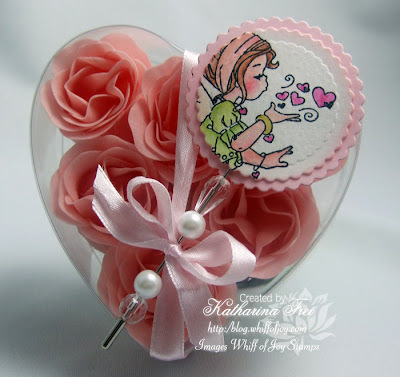 Katharina this is breathtaking - I just adore the soft pretty colours and it's so girly too - love it! Looking forward to seeing all the POM inspiration entries. Stunning work Katharina! It looks so soft and gentle. Thanks for showing how to make the flower. So lovely! 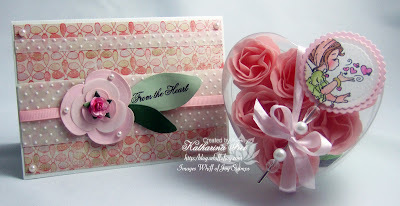 Just love the flower on the card! Oh wow,was für ein wunderschönes,traumhaftes Set! Deine Projektarbeit ist wunderschön geworden, da sieht man richtig -mit viel Liebe- gemacht und die Challenge - Idee mit der Aussicht auf so einen tollen Gewinn - einfach spitze. A really beautiful card. I love the colors Katharina! PHEWWWWWWWWW this is Absolutely Stunning Katharina! WOWEE! I don't even know what to say! I don't really know if I have to post this here, but I joined your challenge and here is my take on it! I just adore your cards. Love the heart filled with soap leaves and the girl blowing kisses. Please tell me where do I buy the plastic hearts? I bought the plastic heart in my local craft shop. It is from a company called Ideal Home Range. 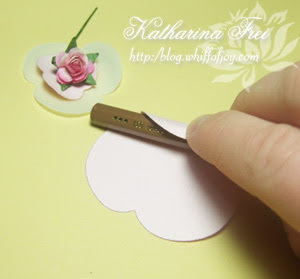 Katharina this is stunning, l;ove the pastel colours. I have made a pillow box for my hubby ... you can find it here. 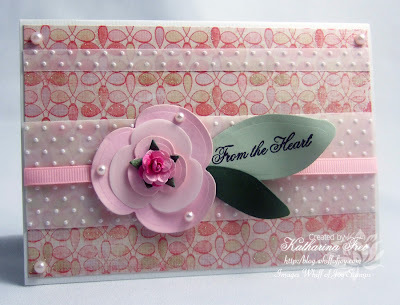 Great project, Katharina, your card is gorgeous! Here is my entry for the POM challenge. Here is my project! I hope you like it! wow katharina, das ist wirklich so schön geworden! Here is my box of chocolates! Wow wonderfull things you all have made. Hi Katherina, my valentine gifts for your challenge are here. Thank you for setting the challenge and thanks for looking. I wanted to show you the cute Valentine's that Ansley (6 years old) made for her class! Here's the project I made. Thanks for the chance to win!